I have wanted to see some of Europe since I was in my 20’s, but time, money and other factors caused me to put my dream on hold until now. And so, I found myself in Geneva on September 11, the jumping off point for a two week introduction to France and Italy. And Switzerland, by extension. My host for the first part of my journey is Alexandre Corn, who lives in Annecy, France, about 30 minutes from Geneva. Alex met me at the airport and we set off immediately on a road trip along the shores of Lake Geneva and up to Zermatt, which lies at the foot of the Matterhorn. 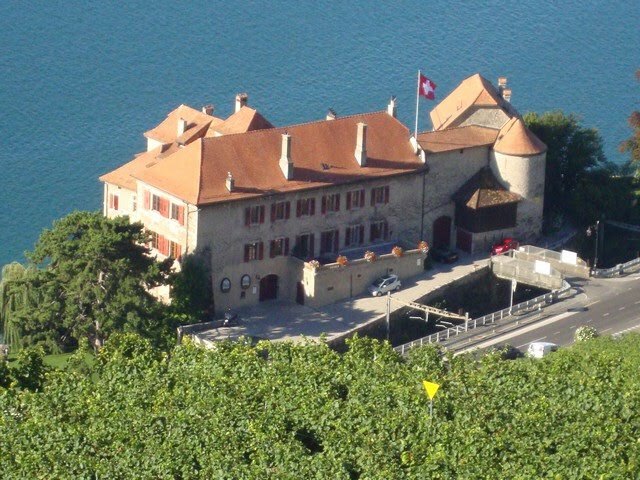 Along the way, we saw miles and miles of grape arbors clinging to the southerly facing hillsides above the lake and a statue of Freddie Mercury in the town of Montreux. Did you know Freddie was born in Zanzibar? Neither did I. 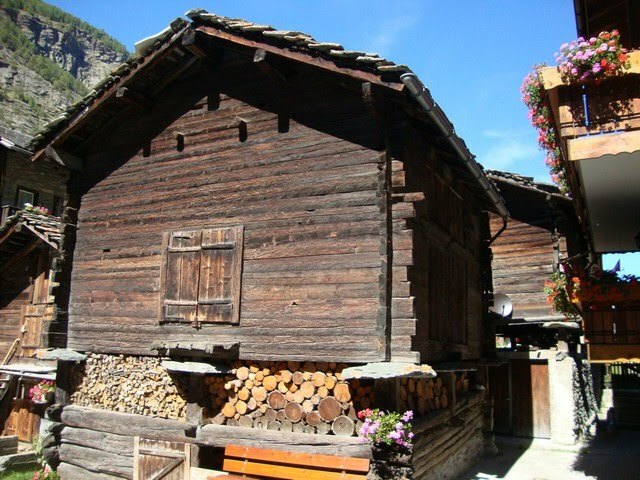 It turns out one cannot actually just drive to Zermatt. Instead, you have to take a bus or a train to get there, so we decided to content ourselves with a visit to Tasch, about 10 miles west. The area is rife with new construction of roadways and hotels and such, which means that the quaint charm of the area will surely be ruined by the quest for tourist dollars. How sad. Tasch is about as quaint and charming as you can get. You almost expect to see Heidi walking by and a St. Bernard around every corner. The oldest building feature a unique style of construction. They are mounted on thick wooden stilts that have a large slab of flat rock inserted between the stilts and the foundation of the building. This apparently isolates the building from rot and rodents, but it makes the buildings look fragile. Still, they have withstood hundreds of years of Alpine weather, so the locals must know what they are doing. Heading back to Annecy, we passed near Mont Blanc and the many aiguilles. or needles, that punctuate the skyline near that impressive peak with its snow capped crest shimmering in the late afternoon sun. It’s interesting to think that Italy lies just on the other side. I confess that jet lag caught up with me shortly after dinner. I was soon nestled in the arms of Morpheus and slept for a full 14 hours before waking to another gloriously sunny day in Annecy. Today, Alex and I took two cable cars (telepherique) to the top of Les Grands Montet. It’s about 12,000 feet at the top and in the midst of les aiguilles or needles that cascade across the skyline east of Mt. Blanc. This is an area where Alex skis regularly and he was shocked at the size and number of boulders strewn across his favorite trails. Things look different when there are 12 to 15 feet or snow on top of everything! The weather was perfect, although there were lots of clouds at the top which kept us from seeing Mt. Blanc. Still, it was a balmy 32 degrees on top. On the way up, several people in the car had bulky backpacks with them. Turns out, these were folks into para-gliding, a sport which involves unfurling a large kite and just stepping off the side of the mountain and riding the thermals coming up from the valleys. Looks like fun! Other groups were hiking all over the glaciers. Apparently there is an annual race from Mt. 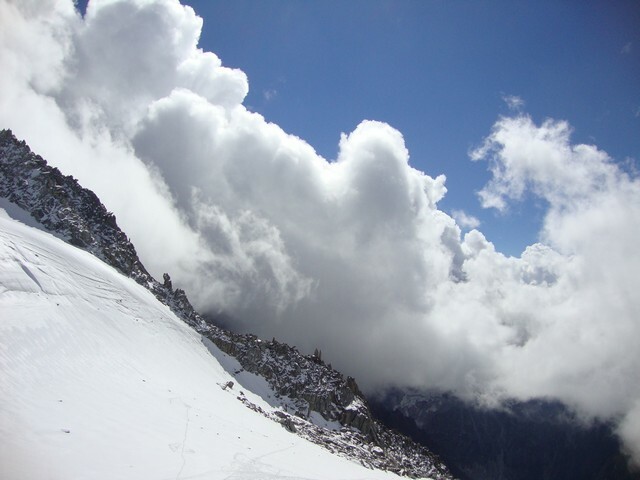 Blanc to Zermatt, some 70 miles away. The good ones take about 24 hours for the trek. It would take me about 24 days……. How could I have spent all this time on Earth and never have heard of Annecy? This city is just amazing in its culture and astounding in its beauty. Small enough that you can walk everywhere yet big enough to offer all the benefits of living in a modern city. La vielle ville, or old city, features a medieval fort, steep streets and an old jail. You can almost imagine knights and nobles in their armor doing battle in the 1500’s. This part of the city features many small canals leading away from the lake. Sidewalk cafes line the canals very much the way they do in San Antonio. There are flowers and parks everywhere and, of course, the intensely beautiful Lake Annecy, a souvenir of the last ice age ringed by impressive mountains. The lake is about 15 miles long and is a mecca for boating and water sports. We took a tour boat around the lake and saw quite a few windsufers and para-sailors, as well as sailboats and the very popular paddle boats. 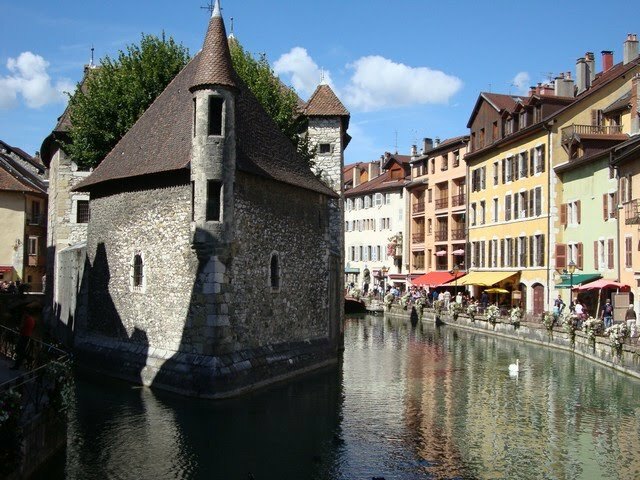 Annecy is a major tourist center. We even ran across a film crew from India filming a commercial about Annecy for the folks back home. In the summer, the town is inundated with travellers from all over Europe. Alex tells me that last year the local government commissioned a survey to measure attitudes toward tourists. 80% said that tourists benefit the economy. But 90% said they didn’t like having so many tourists. Sounds like Newport! I left Annecy in the afternoon. I had a plan. I was going to take the mountain road through the French national forest southeast of Annecy and stop in one of the charming towns near the Italian border. 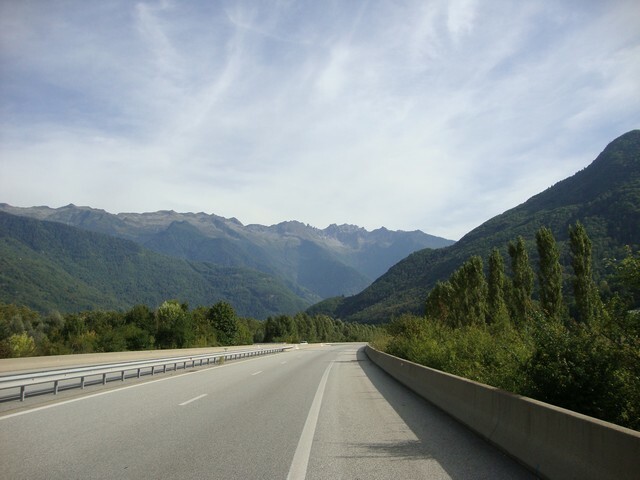 The road led from Annecy to Albertville, site of the 1992 Winter Olympics. But when I got to Albertville, the weather was overcast with a suggestion of rain. The purpose of taking the mountain road was to see the scenery, but the weather made it likely that there would be very little to see and even less to photograph. So I turned onto the autoroute and headed toward Italy. Sadly, this meant I no longer had a plan for the day and no idea where I was going to stay. As I motored into Italy, the change in language meant I no longer had the comfort of my high school French. I was a stranger in a strange land and feeling very awkward and ill at ease. It seemed best to look for accommodations in a city. It was too early to stop for the night in Torino, so I continued on toward Genoa. I will say the road signs in this part of the world are excellent. 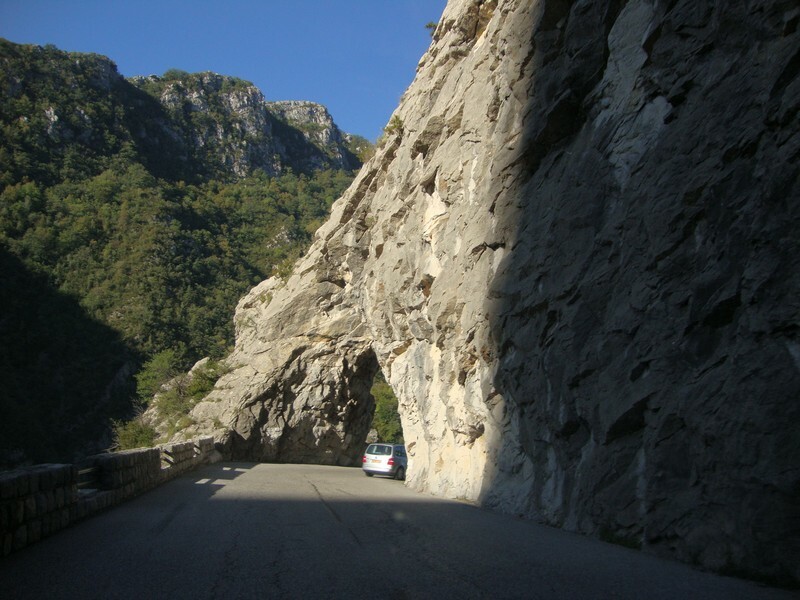 The road to Genoa seemed to slope downward for almost 20 miles, passing through numerous mountain tunnels along the way. At last, I came to Genoa as night was falling and got off the highway. Now what? I drove along the main road near the waterfront. There were a few hotels, but I am not really a hotel kind of guy. I really only wanted to rent a bed for a few hours before heading out again the next morning for Tuscany. It was fully dark know, and I was meandering around a strange city where I didn’t speak the language at all. For the first time in my journey, I felt really lost and alone and wondered if perhaps I had lost my mind when I decided to do this. Then I saw a sign for a B&B. I was saved! The place was quaint and clean. The hosts were more than helpful. For some reason, I couldn’t access their wi-fi hub, so they dragged their computer out of the office for me to use. Have you ever tried typing on an unfamiliar computer with the keyboard in a strange language. If the e-mail my wife got to let her know I was not dead somewhere on the side of the road was short, it was all I could manage under the circumstances. Not a great day, all in all. I took only one picture, which is of the mountains along the way just before I entered the long, long tunnel that took me into Italy. Tomorrow, I will be in Tuscany and the photo opportunities will abound. I promise! 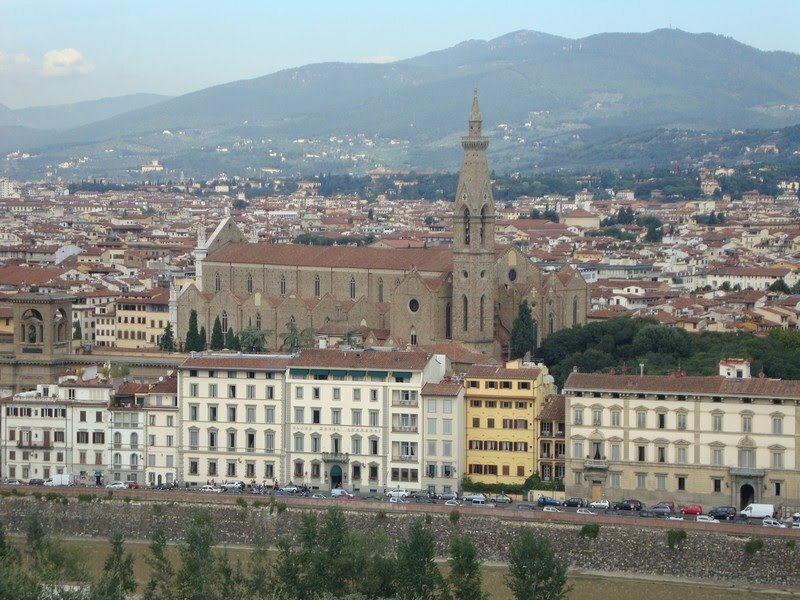 Day Five – Tuscany Or Bust! I headed out of Genoa at 9 am, determined to take the shore road down to Livorno. First things first: the Mediterranean is absolutely, flat out gorgeous! The water is much clearer than I expected, but the waterfronts in all the cities are marred by heavy commercial and industrial use. But outside the cities? Spectacular views from rolling hills, punctuated by roads the swoops and climb up the hillsides before diving down into the next valley. It really is something to see. But after 2 hours or more of crawling along, I had gone all of 25 miles. Time for the autostrada. This highway is a marvel of engineering. In this part of the country, it is little more than an unending procession of tunnels and trestles, constructed in such a way as to make the entire roadway remain at one elevation. Sadly, the Italian engineering that designed this was not so great at telling time and temperature. As I was drifting through the coastal towns, the digital clocks and thermometers varied wildly from place to place. I can see why the Italians were thrilled when Mussolini made the trains run on time! I got off the highway at Pisa, but it was just a gritty city with a famous tower, so I continued on to Livorno, which is just like Pisa, only larger and without the tower. But my perseverance paid off, as I finally broke out of the city and found the road became an enchanting seaside drive that reminded me of the California coastal highway south of Monterey. But now it was time to head inland, up into Tuscany. This is what I had been waiting for. And I was not to be disappointed. The land rose gently up from the sea to much higher hills inland. 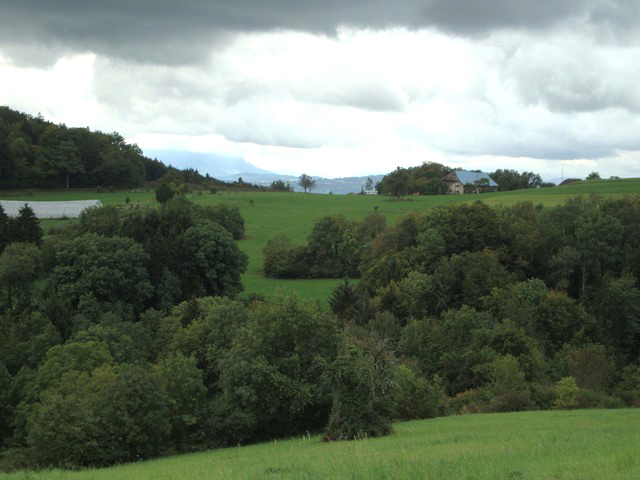 Not anything as high or impressive as the Alps, but mile upon mile of rolling hills and green valleys. The Tuscan forebears obviously knew the old maxim about taking the high ground to protect against attack, because all of the towns are on the highest ground around with virtually no communities in the valleys in between. 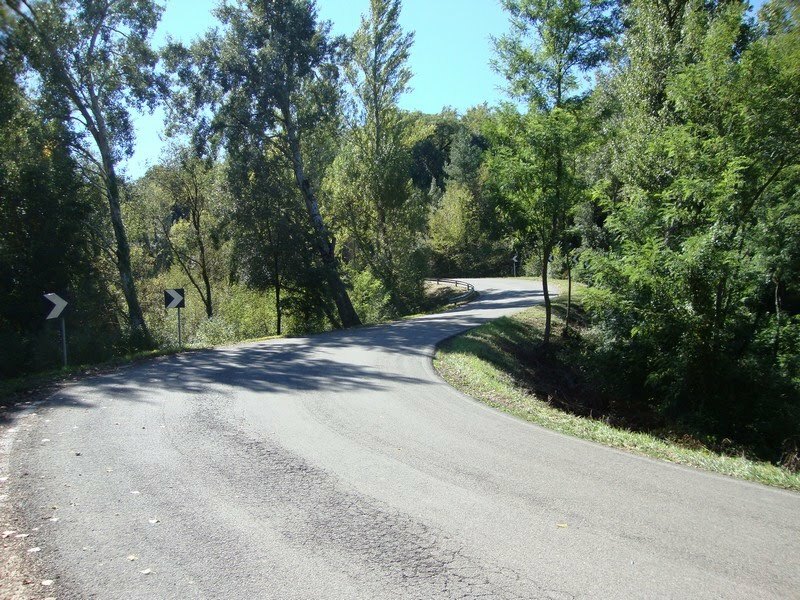 To get around, the roads all wend their way uphill through a series of switchbacks and hairpins until they reach the top, then plunge downward again to the inevitable stream or rivulet below. Then across a small bridge and start climbing again. If you enjoy driving, these roads are immensely entertaining. It’s all 2d and 3rd gear work for the most part, with first used occasionally and 4th sparingly. 5th gear? Fugheddabowdit! 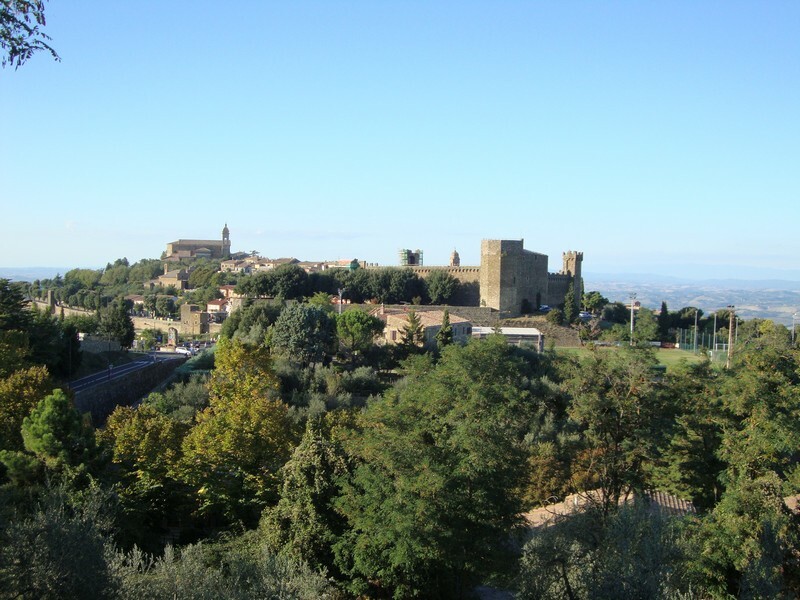 The road I took brought me to Volterra, an ancient walled city on the highest peak around. There are lots of pictures in the attachment. Volterra has the feel of a feudal society about it, except for the Coop supermarket right outside the walls. Here, you can understand that the people were all dependent on the local duc for protection against the savages from the next valley over. From Volterra, I headed for the farmhouse where I will be staying for the next week. And then I got lost. Once again, the road signs are excellent, but the towns were too small to appear on my map. But by keeping the sun at my back and by engaging in a very entertaining conversation with a local fire chief in English, French, Spanish and Italian (! ), I was able to blunder my way here. 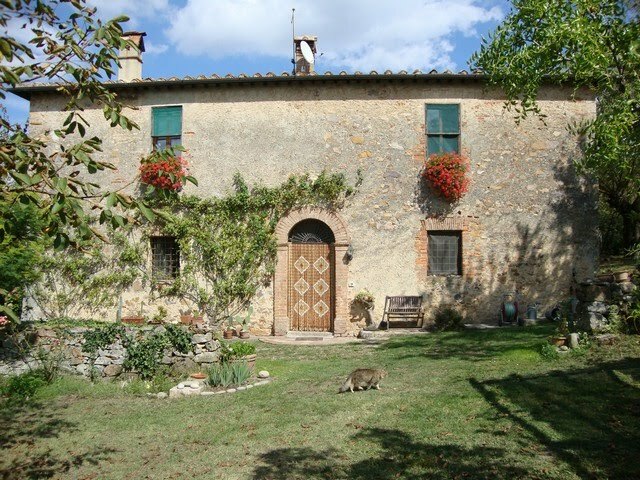 Here is an absolutely lovely old Tuscan farm literally out in the middle of nowhere. It’s just what I wanted – perfect in every way for letting the ambiance of Tuscany surround me and sink into my bones. 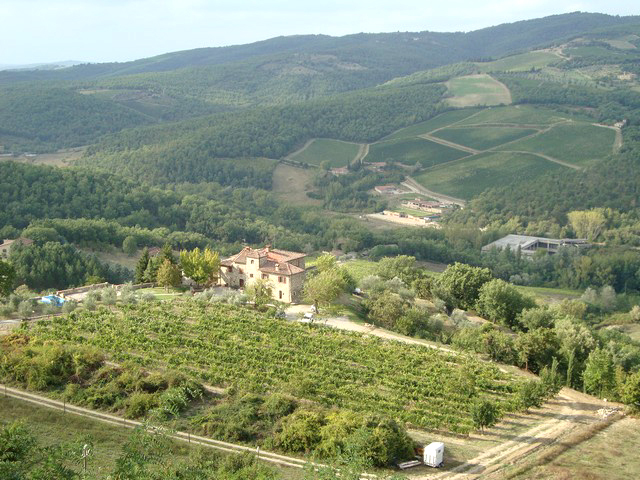 Tomorrow, Paul Jaray is going to meet up with me and take me for a tour of Tuscany. I can’t wait! Today, I pretty much stayed “home” here at the farm in Tuscany and enjoyed the air, the sun, the clouds and the sweet smell of fresh herbs wafting around me on the breeze. I did duck into Siena to find a grocery store, a trip of 40 miles round trip. And I took a walk through yet another hillside Tuscan town called San Lorenzo de Merse on the way back. That’s my home away from home on the right. My room is the just to the right of the front door. There are other pictures of the property where I am staying and of San Lorenzo in today’s link. I have to make a comment about tourists in general. They hurry too much and fail to see what is there before them for the seeing. About 1 kilometer away from my “home” is the Castelo del Tocchi. It is essentially a small walled city overlooking two valleys. I was astonished to find people actually living there. It looks like something out of the Middle Ages. As I was driving back to the main road, a young rider on a nice new BMW motorcycle came into Tocchi. I preceded on my way down the valley toward Siena when the same rider caught and passed me just a few minutes later. There’s really nothing to see in Tocchi.It is made up of about 6 buildings and one street, as you will see in today’s photos. But someone must have told him that it was worth visiting, so he stopped, looked around, then clicked the bike back in gear with a “Been there, done that” attitude and hustled on to his next appointment with destiny. He never found the Castelo or talked to any of the people there as I did. He missed the whole reason for being here. Later in the day, I was walking through the walled city of San Lorenzo, which is quite large. I trekked up and down narrow alleys and steep steps, taking photographs of flowers and roof tiles and noticing everything I could about the town. Frankly, I don’t know how people can live in such close proximity to each other, where all the building are connected, everyone knows everyone else’s business and privacy is more of a concept than a fact. But people do live like that, as their ancestors did for generations before them. Maybe they have no other options. Or maybe they like it that way. Day Seven – Under The Tuscan Sun! One of my internet friends drove up from Grosseto -which is halfway between here and Rome – today to take me on a tour of Tuscany. I am so fortunate to have so many friends who are willing to give of their time to help make this trip a reality. We drove all day with me acting as navigator, reading an Italian map and giving directions in Italian: “Sinestre, Francesco! Sinestre!” What a hoot. We got lost a few times and had great fun. And I saw some of the most beautiful scenery I have ever witnessed anywhere in my life. Tuscany is all rolling hills and valleys. The towns and villages tend to be on the top of the hills with the valleys reserved for agriculture. Vineyards, of course, are everywhere and stretch for as far as the eye can see. 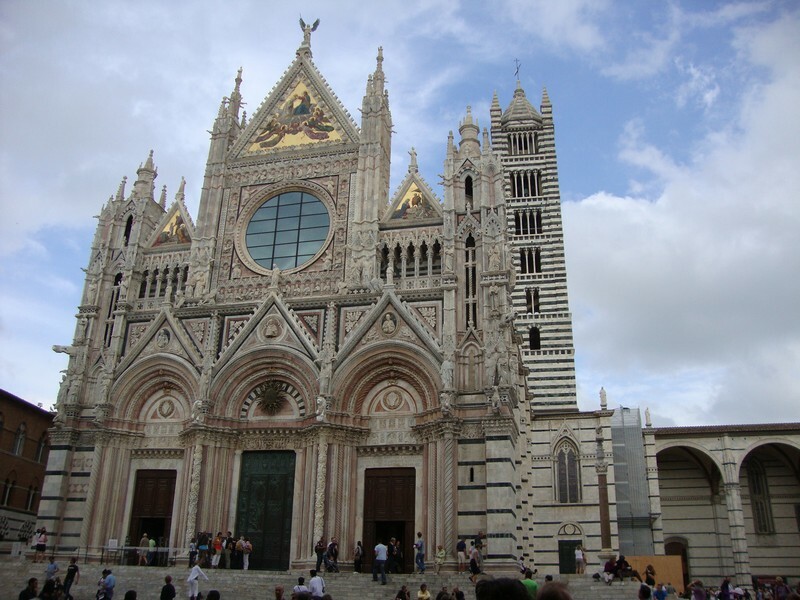 Saturday featured a visit to Siena, a medieval village situated on top of a mountain with a long and proud history. A rival of Firenze for 500 years, Siena is divided into 10 neighborhoods called contrado, each with its own flag, colors and mascot. Some of the mascots I saw were the snail, the fish, and the turtle. In the center of the city is Il Campo, which means literally, the field. For 500 years, since before Columbus raised anchor in Genoa, there has been horse racing around Il Campo. At the top of the city is Il Duomo, one of the most impressive cathedrals to be found anywhere in Europe. Paul Simon wrote these famous lyrics years ago: He looks around, around – he sees angel in the architecture, spinning in infinity…. And yesterday, I felt exactly that way while in the presence of the angels, saints and gargoyles carved into the front of Il Doumo. Ir truly was an awesome moment. When my daughter Kate was young, we used to amuse ourselves on snowy winter afternoons by doing jigsaw puzzles. One of our favorites was called Verticalville. The artist who drew the picture for that puzzle must have visited Siena. The streets are narrow and steep and all the good stuff is at the top. It’s funny how we have wrong ideas about other parts of the world. I always thought the Mediterranean was sort of like Long Island Sound. There was Europe on one side and Africa a few miles away on the other side. I thought you could probably see one from the other. Wrong….. The only way to cure these delusions is to go there and see for yourself. And that’s what I did today. 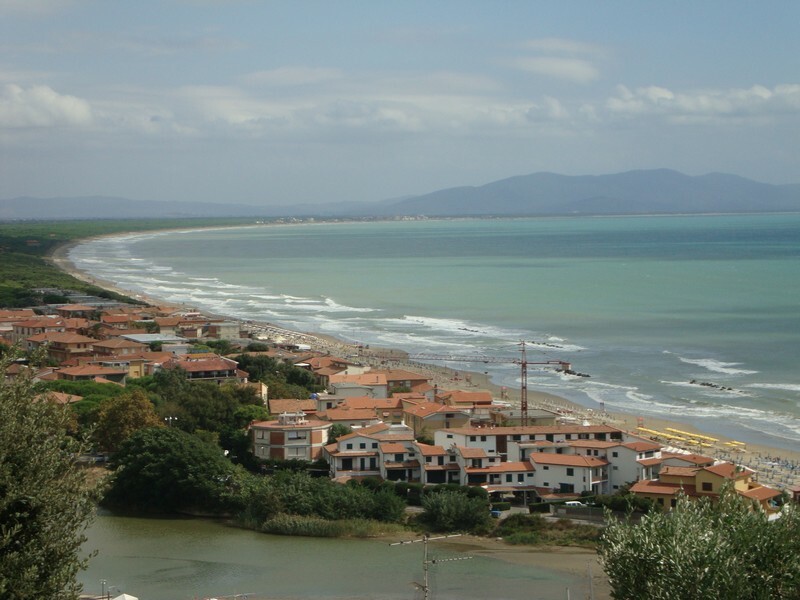 The beach near Grosseto goes for miles and miles. The water is warm enough so you can walk right in and it is noticeably saltier than what I am used to. There was quite a surf, following a thunderstorm overnight, so I didn’t do much swimming. But I did get fully wet and floundered around a little while the breakers tried their best to separate me from my swim suit. Such fun! Day Ten was a 10. Maybe Even An Eleven! This was one of those days you wait your whole life for. A day that quickens the pulse, sharpens the senses and restores the soul. My friend Francesco had a last minute change of plans that prevented us meeting up again, but was kind enough to suggest a proposed route through the Tuscan countryside. Moteroni d’Arbia, Buonconvento, Montalcino, San Quirico d’Orcia, Montepulciano, Castiglione d’Orcia, Radicofani, Pienza, Arcidosso. All are in or near the valley of the Orcia River and I found them all. Every one! It took me 9 hours, during which I traveled all of 150 miles. The miles per hour average may be a little low but the smiles per mile quotient was off the charts! This part of Italy is beautiful in a way that defies words. And so I am going to let the photos do the talking. The weather was faultless – the sky a vault of deepest blue over the landscape without a cloud to be seen from horizon to horizon. The sun at this time of year slants a little lower in the sky, adding an extra measure of contrast and shadow to the scenery, which stands out in bold relief against its warming rays. But this part of the world has something else very special: roads that virtually dare you to drive them well. Hell, the double dog dare you! And I was happy to take up the challenge. They slither across the land, swooping and plunging from the hilltops into the valleys and back again. Your hands are constantly moving over the wheel, your feet dancing across the pedals, and straights, when there are any, are measured in meters, not miles. Francesco told me the roads the would be the highlight of the day and he was so right. Never, ever in my life have I encountered so many wonderfully twisty roads that seem to go on forever. Oh, how I wish I had packed my Miata in my suitcase! But my el cheapo Toyota Aygo was actually more than equal to the task. The suspension is quite competent. It doesn’t roll over onto the door handles in curves like a ’49 Buick. The steering is accurate and the brakes powerful. There were times when I finished a downhill run and paused by the side of the road to take a photo when I was enveloped in the aroma of wild herbs and hot brakes. To a car guy, nothing smells sweeter! I went to Florence at long last today with my two friends from Slovakia, Erik and Slavia. We had a great day, but I must say that, after the tranquility of Tuscany, the city life was a little jarring. Great architecture and sculpture, but too many people for my taste and too much aroma of exhaust fumes. I guess I have been spoiled by my week in Tuscany. This has been a week I will always treasure and I admit to being a little sad to leave here tomorrow morning at dawn. When I think of this trip, I think of some of my favorite John Denver lyrics: “I’m going to see some friends of mine, some that I don’t know.” I have made many friends in my travels so far and tomorrow I meet another internet friend, Malcolm, who lives near Cannes and was kind enough to invite me to come and stay the night with him and his family. I left Tocchi bright and early Wednesday morning at 7:00 am and picked up the Auto Strada outside of Florence. From there, it was an easy cruise over to France and I arrived at the place where I was scheduled to meet Malcolm Wood an hour early. So I followed the directions he had given me and managed to find his home in the village of Valbonne. And what a lovely place it is! 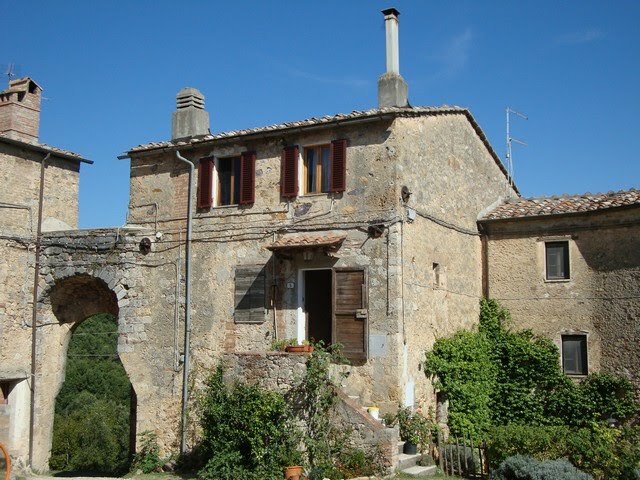 It resembled the Tuscan villages I had become familiar with – a compact and tranquil place, compact and vibrant with activity in its narrow streets. 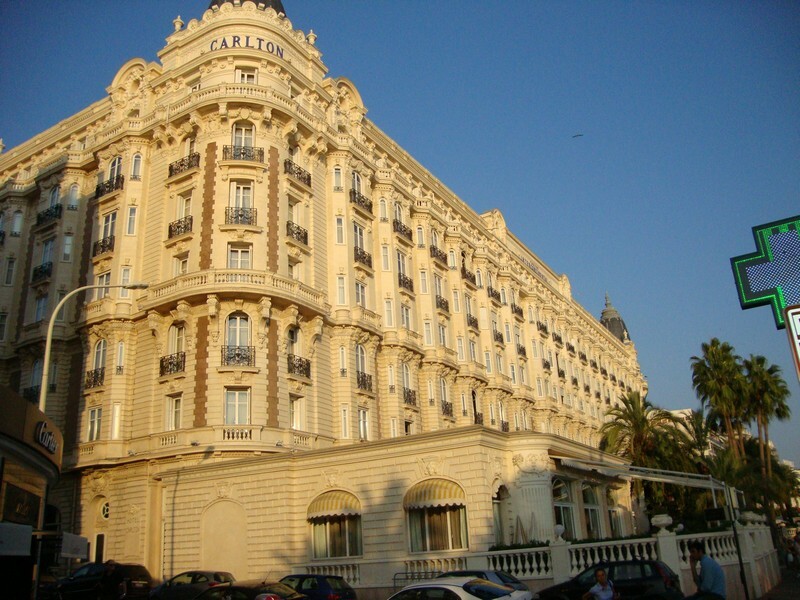 Malcolm then took me on a tour of Antibes and Cannes, where we walked among the rich and famous and saw the gorgeous beaches that line the Mediterranean. Antibes was just delightful, but I got the impression that Cannes was trying oh so hard to be hip and cool and with it. The people who hang out there are not the kind of people I had come to see. There is a charming old neighborhood at one end where the tourists and the wealthy never go. That looked more like my kind of place! That night, we ate in the open air main square in Valbonne and had a lovely meal under a bright full moon. Malcolm regaled me with tales of his time in the merchant marine and his travels to virtually every port in the world at one time or another. He grew up in the Shetland Islands in Scotland and has Scottish burr that has been sanded down by the years away from home but it still delightful to listen to. He also has an encyclopedic knowledge of vintage race cars and race drivers. In fact, one of the cars I photographed at Il Campo in Siena a few days before was driven by two of his neighbors. I awoke in Valbonne to yet another glorious day. The weather during my trip has been great and today was no exception. I needed to return my rental car by 2:45 pm. MapQuest said it was a 5.5 hour drive along the Auto Route, which would take me southwest down to Marseilles before turning north toward Grenoble and eventually on to Annecy. Since today was the date for a nationwide protest against the government, and since Marseilles is famous for its anti-government stance, Malcolm suggested the highway might be quite congested in that area, I looked on the map and decided my best route was from Grasse to Digne and on to Gap before rejoining the Auto Route near Grenoble. It looked to be the most direct and efficient way to go. This is one of those cases were a dash of local knowledge can be very helpful. Little did I realize that the road I had selected ran straight through the French Alps!!!! Now, the Alps are littered with quaint little villages and awesome scenery, but driving in them is a little like tacking upwind into a gale against a running tide. It takes about 40 miles of driving to make 10 miles of forward progress. I don’t think I have seen so many first gear switchbacks in my life! My target was to reach Grenoble by noon. I got there at 1:30. But, oh! What a fantastic journey it was!! The drivers in this area are far better than Americans. I got behind one woman in a Peugeot 206 diesel who led me on a merry chase for better than a half hour as I struggled to keep up. I swear you could pluck ordinary citizens off the streets, stick them behind the wheel and they would beat les pantaloons off you and me. I was passed by electrician driving a work van with ladders lashed to the roof at one point. He soon sailed off into the distance so fast it was like I was tied to a rock.! The scenery was amazing. And so I had one hand on the wheel, one hand on the gearshift, one hand on the camera, one hand on the map and one hand in my lunch bag all the while. I apologize for the lack of artistic framing of the pictures I took along the way, but I knew by then that it was going to be a close race to get to Annecy on time and I didn’t have time to stop. So my picture taking adventures came to an end and I concentrated strictly on getting home. All I had to do now was pickup the highway and cruise into Annecy. But somehow I got on the wrong highway. I was now headed to Lyon, which is about 100 miles west of where I wanted to go. I pored over my map and decided my best alternative was to exit at Voiron and wend my way northeast to Chambery, where I could get back on the highway. Now, the clock is ticking and I am back on a rural route through some mountains and lots of little towns with names like St. Guilliaume of the Fleur de Lis, St. Bernadette of the Blessed Valley and St. Henri of the Holy Sandwich. All cute as can be and all traversed at speeds approaching 15 mph. Tick, tick, tick……. At last, I steer back onto the highway. I have 20 minutes left to get to Annecy. I push the Aygo up to 150 kph, which is as fast as it will go. Tick, tick, tick…… Then I see a sign: Annecy – 88 km. NOOOOO!!! The game is lost. All those hours of pushing to gain time are for naught. Curse words ensue. But wait! Here comes another sign. Annecy is but 30 km. It is Geneva that is 85 km away! I can still make it if I really, really try. I have to get gas. A service area magically appears with no other cars at the pumps to interfere. I sprint to the office to pay and sprint back. I am back on the road and back up to 150 in no time. On the downhill parts, I see 160 once or twice. The exit takes me directly toward the bus station, which is where the rental agency is. I find a place to park the car and dash to the office. I hand them the keys. They type some information into the computer. And they are smiling at me! They are happy to have their little car back. I am happy to give it back to them. Everyone is happy and smiling and I feel like Sterling Moss at the end of the 1952 Mille Miglia when he found out he had won the race. What a great day this has been! Yesterday was a national day of protest here in France and I got to watch it up close and personal, as they say. I was profoundly shocked and disturbed by what I saw. Why? Not because the people here were marching and sounding off about their grievances against the government, but because it made me realize that nothing like this could EVER take place in the United States any more without squadrons of riot police carrying rifles, batons and tasers or without massive arrests. And WE claim to be the land of the free! Hogwash. I watched about 10,000 French citizens take to the streets under the watchful eyes of perhaps a dozen policemen within my view. 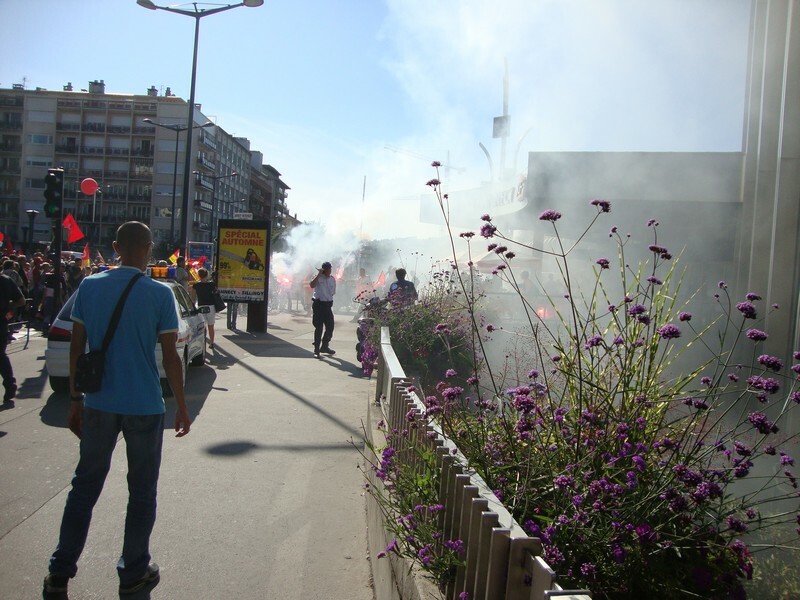 Some of the protesters lit highway flares and were whipping up the crowd amidst a display of fire and smoke. The cops just observed. No official action was taken. How is this possible? In America, we are required to obtain a parade permit before being allowed by our government to stage such a demonstration. 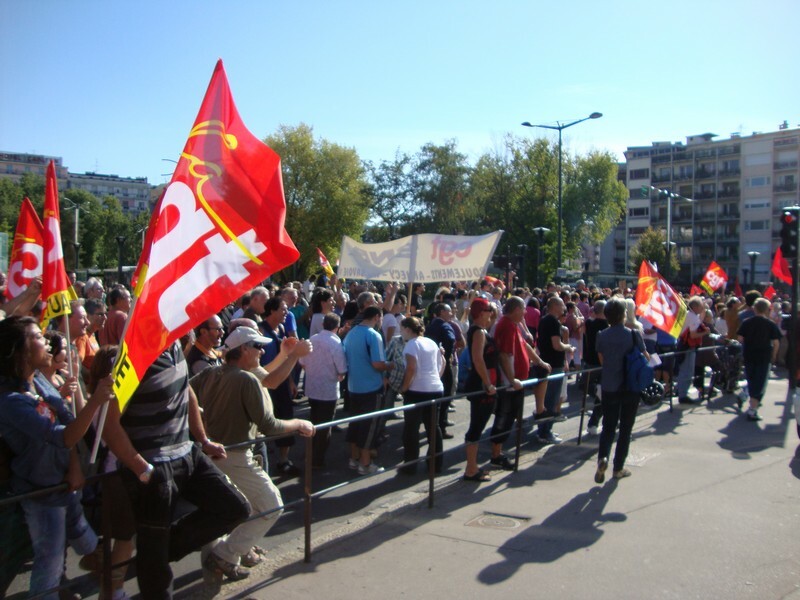 In France, the organizers simply notify the government in writing of the date and time of the demonstration and the route it will take. The government then dispatches the police to close off the necessary roadways at the appointed hour. Try THAT on Pennsylvania Avenue or Main Street, USA. In France, the protests are not confined to “designated protest zones”, fenced off enclosures miles away from the seat of power. Such a thing would be considered ludicrous in France. Bear in mind that the writings of Jean Jacques Rousseau were a powerful influence on the men who constructed our Constitution, along with such kindred spirits as John Locke. “Liberal,” in the political sense, means nothing more than that the people own the country and the government and not the other way around. And yet, in America today, “liberal” is a term of scorn and derision. How far downhill we have traveled from the lofty ideals upon which our nation was founded. America is many things, but that doesn’t mean we are the best at everything or even most things. If we refuse to see what is going on in the world around us, we do so at our peril. I got back to Annecy on Fridayt, Day 13 of my trip. On Saturday, I slept in and then went with Alex to a lovely riverside home in the country, where he played music with his band for 5 hours. Truthfully, it was one of the highlights of my trip! During the evening, I heard songs in English, French, Russian and Spanish. I think my favorite was a rousing version of The Irish Rovers. These lads are very talented! Sunday was cold and overcast, so we hung around the shanty and then went for a ride later in the afternoon to the small town of Pringy (pronouced Pron-gee, more or less) where young Alex spent his formative years. There are some photos from above the town attached and I have to say, it was a peaceful and very beautiful place. With the city of Annecy just 10 miles away, it’s the kind of place where I could live and be very happy! And then on Monday, my odyssey came to an end. Now that I have been home a week, it’s time to reflect on the journey and figure out what, if anything, I learned. One of those things is that travel is about meeting people, not seeing places. I met some warm and wonderful people along the way: Alex, Francesco, Slavia and Erik, Mariassunta and Claudio, Malcolm, Alex’s parents, Patricia and Jean Claude and his two delightful sons, Valentin and Emmanuel. All were unfailingly kind to me and all made me feel instantly welcome. Thank you to you all. How often in life do we get to make a dozen new friends in just two weeks? It was an incredible experience. I also had some of my prejudices exploded. I grew up in a part of the country where the Mafia was in the headlines almost daily. Mob hits were legion. Years ago, a red Ferrari was dredged up near the Providence ship channel, its owner still behind the wheel, encased in concrete. The same dredging operation turned up dozens of skeletons with their feet encased in cement, something that was referred to locally as “Italian overshoes.” Suffice to say, my opinion of Italians in general was rather negative. But now that I have been to Italy, and seen for myself the wonders that country has to offer, that opinion has been totally exploded. I can’t wait to go back and explore the 90% of the country I did not see this time around, especially the east coast that borders the Adriatic. I learned that in France, civil protest is handled entirely differently than here at home. How is it possible that 10,000 protesters march through a city without riot police and SWAT teams ready to swoop down and make mass arrests. How civilized are we here in the US, really? I wonder…..
1. Nowhere in our collective memories did Jesus EVER tell His followers to kill people they didn’t like. 2. 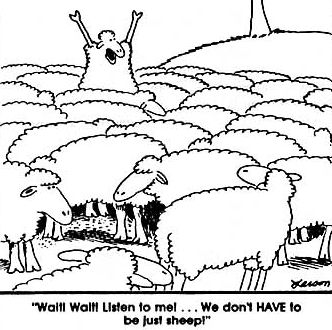 Everyone feels their government is too powerful and intrudes too much in their lives. 3. All of us are concerned about what sort of world their children will inherit. 4. We all are worried that our governments are being dictated to by powerful and wealthy interests. 5. Things would be better if the people had more say in their own affairs. That’s a pretty impressive list for a group of people of different ages, different nationalities, different education and different life experience. Was it worth two week of wandering to learn these things? Absolutely! And finally, after watching dozens of organized tour groups during my stay in Europe, I got to reaffirm my belief that choosing the road less traveled really does make all the difference.